My second day with the ice cream maker. I was actually looking for a recipe for a yogurt flavoured ice cream, sort of like the ones you would find in Japan or Asia, not frozen yogurt. But then these three little words (well, not so little when you love it like I do, they pop out like giant bold letters) dulce de leche popped up on my search results, I HAVE to see it (it's not like I was having any luck either with my original search). I like the fact that it’s got cream AND yogurt, so it shouldn’t be too tangy or sad. 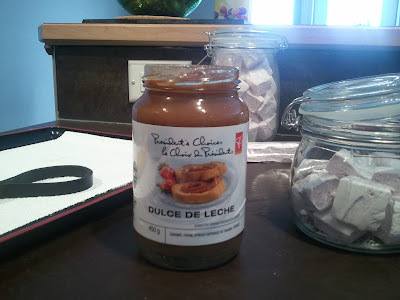 Ran out to Stupidstore and bought 2 jars of dulce de leche. I didn’t even know Stupidstore carried it until I Google’d it. It certainly saved me a lot of time and sanity, because if you’ve read my Not Nougat entry, you’d know not to ask me to caramelize sugar or anything of the like again. I had to refrain myself from eating the whole jar with a spoon. The stupidest thing of making ice cream is that the stupid bowl needs to be chilled in the freezer for 15 hours! 15!! So, if I only remember to pop it into the freezer before bed, that means it’ll only be ready by 3pm, and when all is said and done, the ice cream would be set by maybe 9pm. A little late for dessert in my opinion. Note: It’s preferred that you weigh everything out instead of volume. 1. Measure everything out and add to a large bowl. 2. Whisk together all the ingredients. I think this will also give a fluffier texture to the cream since you are aerating it. 3. Make the ice cream according to the instructions of the manufacture of your machine. With a Kitchen Aid machine, always start the motor on “stir” and pour the ice cream batter in while it is running to avoid ice cream being frozen to the walls of the bowl. Lick the dasher! No wasting allowed!! 4. Scoop out ice cream and place into a plastic container. I rinsed out the yogurt container and put the ice cream back in it. 5. Allow to freeze for about 4 hours before serving. I need to reduce the amount of yogurt in this recipe if I am going to continue to use Balkan yogurt (or maybe just yogurt in general). As it turns out, the tartness of the yogurt is over powering the dulce de leche. It's still awesome, but the awesomeness of the leche needed to be brought out with dollops of more leche from the jar.